Porsche will let you live out your race car fantasies. 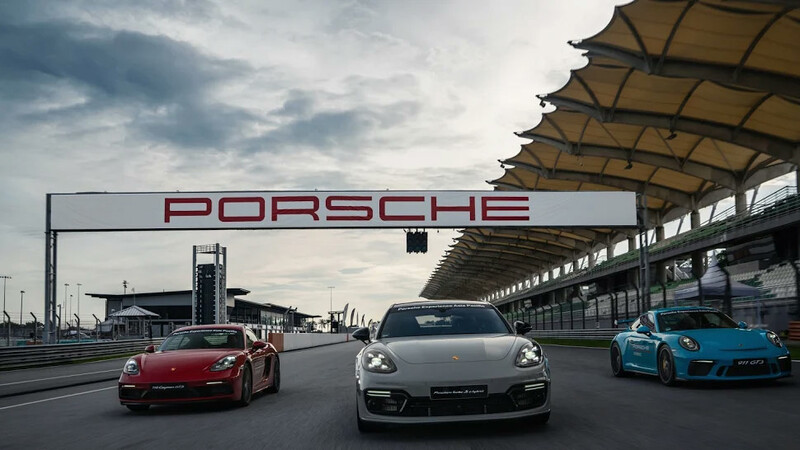 For a couple of years now, the folks at Porsche Asia Pacific have invited journalists from across the region to the Sepang International Race Track in Kuala Lumpur, Malaysia for its Porsche Media Drive Academy (MDA). 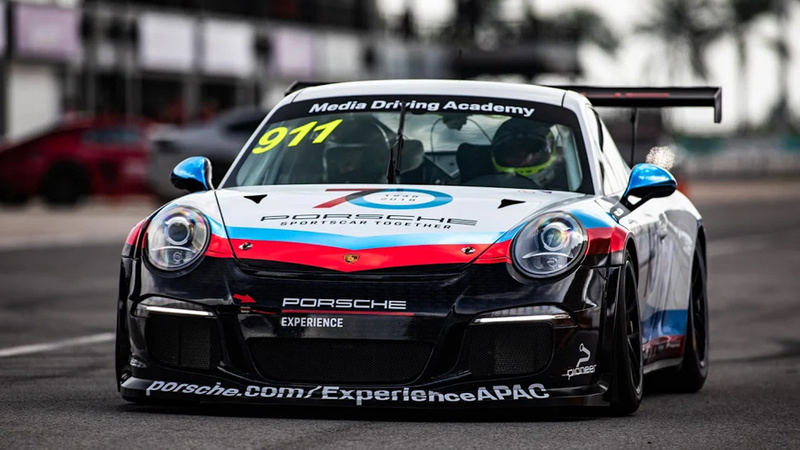 More than just an opportunity to improve their driving skills and pick-up a few race car driving tips and tricks, it’s a chance to experience what it feels like to get behind the wheel of Porsche sports cars, drive it on an actual race track and see what these babies can really do. I only thought I knew what I was getting myself into when I participated in the course last year. Together with a few colleagues, I was part of the Individual level, which is basically the course for beginners. Thankfully, I managed to complete the training without any incident and, more importantly, without making a complete fool of myself. Receiving the invitation to come back a year later for the next step in the program was a thrill, but I felt just as nervous as excited. Receiving the invitation to come back a year later for the next step in the program was a thrill, but I felt just as nervous as excited—maybe last year was a fluke, maybe the exercises are a lot tougher and maybe they’ll discover I really can’t drive to save my life. These were the things going through my head as we drove up to the Sepang track that early Monday morning. It helped that we started with a refresher on the stuff we learned last year. The instructors went over the basics of driving physics—how braking and accelerating affect weight distribution on cars and how to use both to your advantage on the track. They also reminded participants about the proper seating position in the car—seatbelt secure, wrists just over the steering wheel when outstretched, and just enough distance between the torso and wheel. It was funny when they demonstrated the wrong way to drive—“New York taxi driver” style (just one hand on the steering wheel), “bunny” style (body too close to the wheel, both elbows bent like a rabbit), and “Italian lover style” (left hand on the wheel, other arm outstretched towards passenger seat). The practical exercises started with a review of last year. The moose test was an exercise on stability management (driving at full speed, stepping off the accelerator and quickly swerving to avoid hitting an imaginary obstacle on the road). For this we used a 911 Carrera T and the latest-generation Cayenne. For the Braking Test, where we drove at full speed, braking hard and quickly turning the car left or right, we used a 911 Turbo S. Finally, we put the 718 Boxster to the test in the Slalom, where instructors timed us as we quickly turned left and right while navigating a series of cones. Organizers divided the track into three sections, which we tackled one at a time. 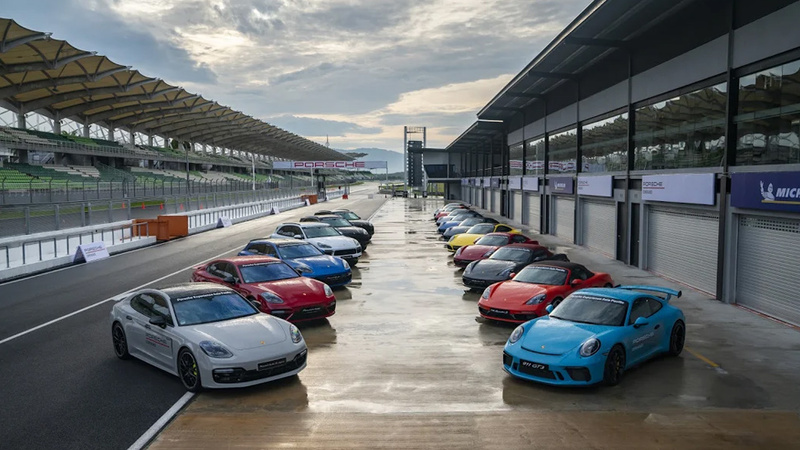 Behind the wheel of a suite of Porsches, including 911s, 718s and a few Panameras (the German marque’s four-door sedan), we burned rubber and let loose angry growls from the machines. It’s music to the ears for any driving enthusiast. In Day Two, it was all about further honing our racing skills by driving faster and more efficiently around the track. For professional race car drivers, a millisecond could mean the difference between a champagne bath at the podium or watching glumly from the sidelines, so every little bit to shave precious seconds off your time helps. We started with fitness exercises led by a certified trainer who explained the importance of being physically fit for race car drivers. Then, it was back to the track. In trail-braking, we learned the proper way to adapt to the corners of a track by using the brakes. Motorists take it easy with the brake during regular driving, applying gentle pressure and gradually increasing until we come to a full stop. I unlearned that at the MDA. We drove the cars at full speed, sometimes approaching 160 to 180 kilometers per hour, and then abruptly applying the brakes at strategic points when approaching a turn. 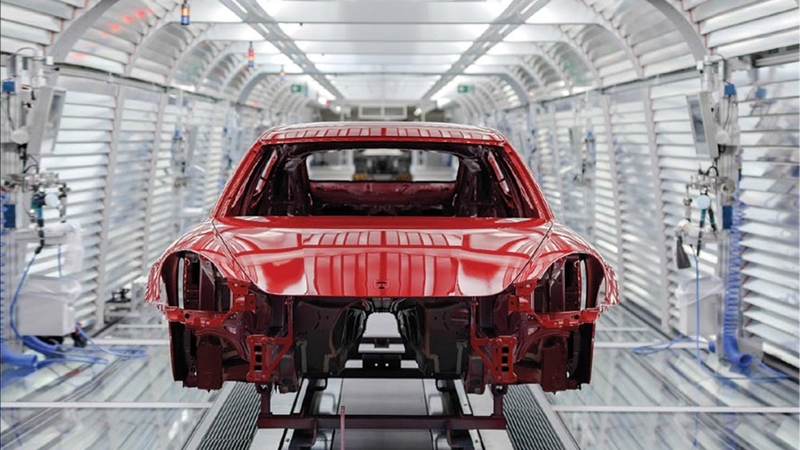 With traction and more wheel load in the front, the car can then turn in quicker. Instructors taught us how to use the throttle to turn the car left or right, a way to maneuver the car without necessarily applying the brakes, during the throttle-steering exercise. Finally, we revisited a version of the moose test where we drove at full speed, then abruptly swerving to the right to avoid hitting an obstacle. it was possibly the most practical lesson of the day as it’s something that we can apply when we drive on regular roads to avoid collision with a pedestrian or a stalled car. With the exercises done, it was time for the guided drive around the Sepang track. 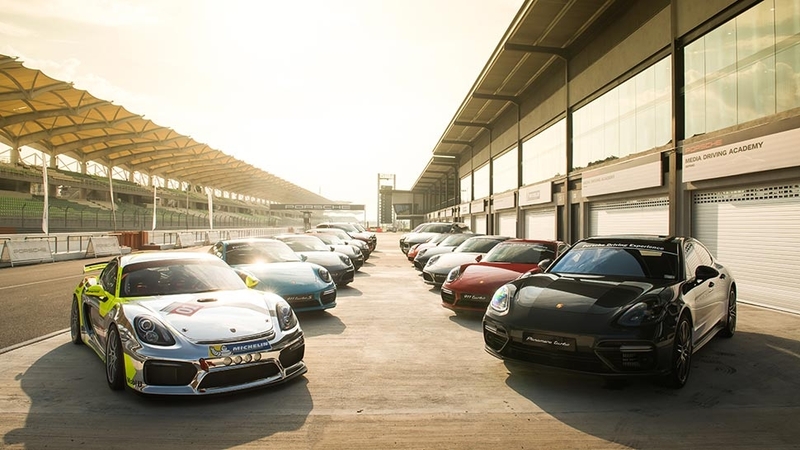 All the participants were divided into groups and took turns commanding the wheel of an eye-popping array of Porsche’s finest, which organizers said was the best model range ever—718 Boxster GTS, 718 Cayman GTS, 911 Turbo S, 911 Carrera S and Carrera T. But, without a doubt, the hands-down favorite of most of the participants (including myself), was the 911 GT3, a car that was so technically precise and exuded so much class and power I felt like I could do anything while I was behind the wheel. It was the adult version of a kid in a candy store—lap after lap, we pushed the cars and ourselves as far as we could go, unleashing our inner Schumacher, Raikonnen or Hamilton. After two full days of exercises I could see the improvements in how I took on the course, unloading the bad habits I’ve taken on after years of driving in the roads of Manila and putting into practice the learnings from the MDA. Indeed, if there was one lesson I took to heart, it was that driving on a track is a lot like learning how to drive all over again. 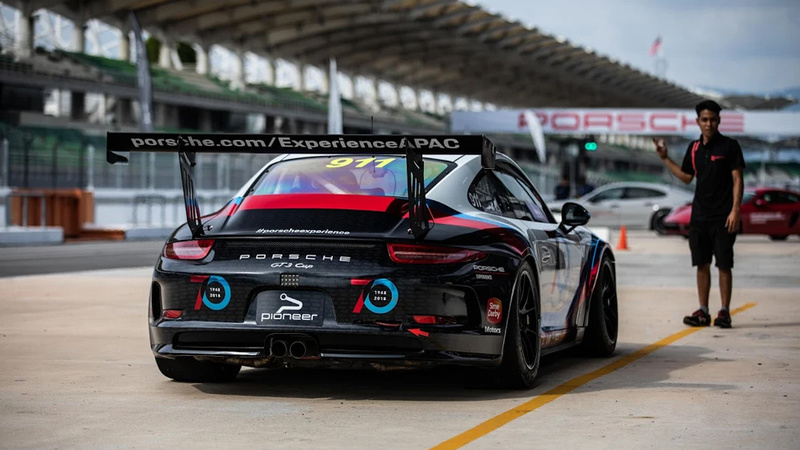 As a treat, select participants got to suit up and ride shotgun to Will Bamber, himself a racing driver and instructor and younger brother of two-time Le Mans champion Earl Bamber. Driving a GT3 Cup Car, Bamber didn’t hold back as we completed one full lap around the track in record time. At one point it felt like I was flying. 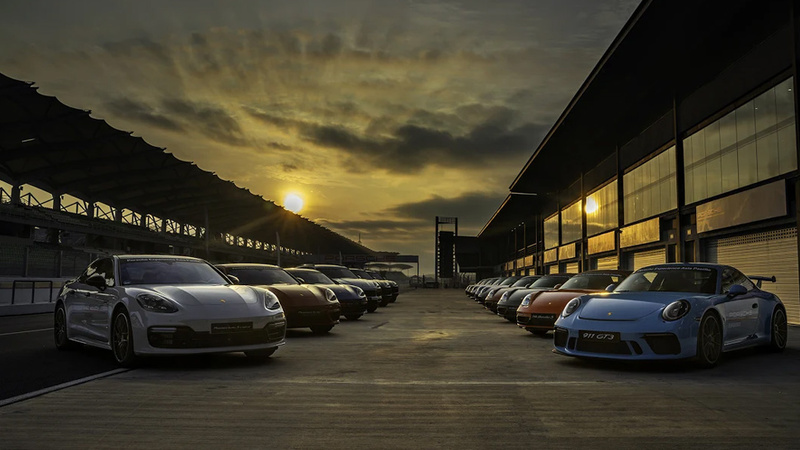 As it turned out, Porsche scheduled both the Professional and Elite levels of the MDA over the two-days, which meant we were handed certificates for both during our “graduation.” It was a nice little souvenir for a truly one-of-a-kind driving experience. So technically, I can say that I’m not just a “professional” but an “elite” race car driver, just in case anyone asks. Members of the public interested in the Porsche Experience can view more information in the Porsche website.